Chiang Mai is a city filled with temples. As you explore the Old City you can’t walk more than a few feet without seeing one and they are all well worth your time as a traveler. 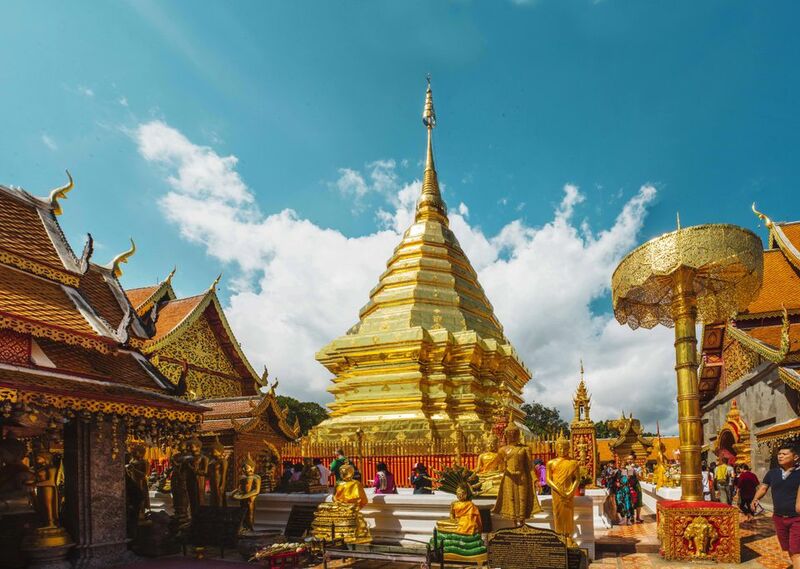 But one of northern Thailand's most sacred temples, the one that crowns the Doi Suthep mountain on the western outskirts of Chiang Mai, is definitely something that shouldn’t be missed. Planning a trip up the mountain to see the temple is a fairly easy endeavour from Chiang Mai and there are various ways to do it. No matter which option you choose, the views from the temple and the beauty of the surrounding area make for a worthwhile day trip from the city. Read on to find out more Wat Phra That Doi Suthep, getting there, and what to expect when you arrive. Suthep itself is a district of western Chiang Mai city and one that gets its name from the adjacent mountain (doi means mountain in northern Thai), and the temple on the summit—Wat Phra That Doi Suthep, is found on the mountainside. The mountain, plus neighbouring Doi Pui, form Doi Suthep-Pui National Park. In terms of the impressive temple, construction on Wat Doi Suthep began in 1386 and according to popular legend, the temple was built to hold a piece of bone from the Buddha’s shoulder. One of those bones was mounted on a sacred white elephant (an important symbol in Thailand) who then climbed Doi Suthep mountain and stopped near the peak. After trumpeting three times, the elephant laid down and gently passed away in the jungle. The place where he lay is now the site of where Doi Suthep’s temple was founded. There are several ways to get yourself up Doi Suthep to see Wat Phra That Doi Suthep, including renting a car, a motorbike or scooter if you’re an experienced rider, hiking, getting a ride in a red songthaew (red trucks that act as shared taxis all over Chiang Mai), hiring a songthaew for the duration of your trip, or by doing a guided tour. Driving: If you decide to drive yourself (either via car or motorbike), you’ll be taking the 1004 (also called Huay Kaew Road) towards the Chiang Mai Zoo and passing Maya Mall en route. The route is a straight one, but the road itself has some curves, so anyone with minimal motorbike or scooter experience should consider alternate transportation. But if you have your international drivers licence and feel comfortable riding, this is a good DIY option up the mountain. Drive until the road finally widens and you see the crowds and flags in the trees. Taking a songthaew: One of the most popular ways to get to the Wat Phra That Doi Suthep is via the many red songthaews that ply the streets of Chiang Mai. If you want to take one to the temple, they leave from Huay Kaew Road near the Zoo, costing 40 baht per person each way. Normally drivers wait for eight to 10 passengers before leaving. You can also charter songthaews from anywhere in the city, which is a good option if you are traveling with a group. This should cost 300 THB for one way (as many people as you can fit), or 500 THB if you want the driver to wait at the top and bring you back down after visiting the temple. Hiking: Anyone in the mood for some exercise can opt to hike up to the temple, via Suthep Road, past Chiang Mai University to find the start of the hike. When you see a green area, you'll notice some billboards and a sign reading “Nature Hike”. Turn right onto this narrow road, go straight for about 100 meters then take the first (and only) left. Follow the road to the trail head. Once you get to the base of the temple, you have two options for getting up to it. You can walk up the 306 steps if you’re feeling energetic, or you can take funicular-style cable car, which runs from 6.00 am – 6.00 pm. The fee is 20 THB for Thais and 50 THB for foreigners. Once you’re up the mountain (via whatever method you’ve chosen), you’ll see a large cluster of souvenir stands and stalls selling food and drinks before you head up to the temple. Grab a snack if you’re hungry, and then it’s time to climb the 306-step staircase (or take the funicular). The staircase is flanked by beautiful jeweled naga (ornate serpents) and as you walk, the majestic staircase is a great spot to take pictures. The terrace at the top of the steps is where you’ll find a statue of the white elephant that (as legend has it) carried the Buddha relic to its resting place on the temple grounds. This is also where you’ll find various other shrines and monuments to explore. The temple is split into outer and inner terraces and steps lead to the inner terrace where there is a walkway around the golden Chedi (shrine) enshrining the relic. The grounds are lush and peaceful and there are many spots for good photo ops or just simple quiet contemplation. Plan to spend at least a couple of hours exploring the temple and surrounding area and if you have more time, there’s the option to hike various trails and swim in waterfalls in the national park that is home to the temple. Entrance to the temple costs 50 THB per person and as you’re planning your trip, remember that dress needs to be respectable, meaning modest and shoulders and knees should be covered. If you forget, wraps are available if needed. You’ll also need to remove your shoes upon entering the temple. Something else to remember is that Wat Phra That Doi Suthep can get very busy, so if you can, try to time your visit for as early as possible during the day. Otherwise, a day trip to the temple makes for a refreshing and culturally interesting day (or half-day) excursion from Chiang Mai. It’s no secret that Chiang Mai is home to many temples, which you may have seen several of on a visit to the Northern Thai city. But even if you’ve had your fill of temples (or think you’ve seen them all), planning a trip to see Wat Doi Suthep is worth your time, even if just for the photo-worthy views. In addition to those aforementioned views, the golden, gleaming temple itself is highlight, but don’t rush your visit. There’s something beautiful to see at every turn. Wat Phra That Doi Suthep temple also houses a meditation center, where both locals and visitors can learn and practice meditation.